By default, a ListBox uses UI virtualization, creating UIElements for each list item only as they are scrolled into view. This is normally what you want, since using UI virtualization improves the performance of the ListBox when it contains a large number of items. You can, however, disable UI virtualization by setting the VirtualizingPanel.IsVirtualizing property on the ListBox to false. In the example below, we load two ListBox controls with a list of 100 numbers. 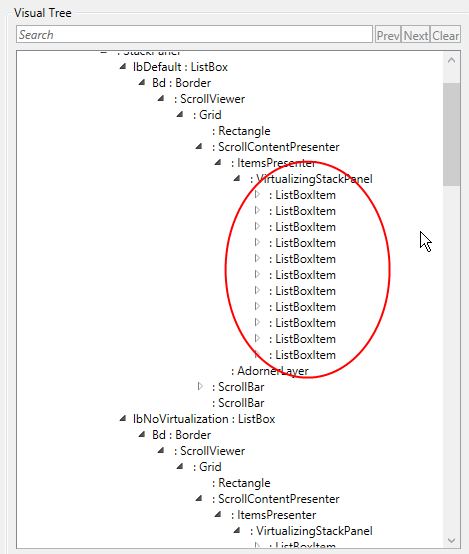 We turn off UI virtualization for the second ListBox and then examine the visual tree of each ListBox. <ListBox Name="lbDefault" Margin="15,10" Width="70" Height="200"
<ListBox Name="lbNoVirtualization" Margin="15,10" Width="70" Height="200"
In the ListBox that does use UI virtualization, the visual tree shows that it contains only a small number of ListBoxItems. 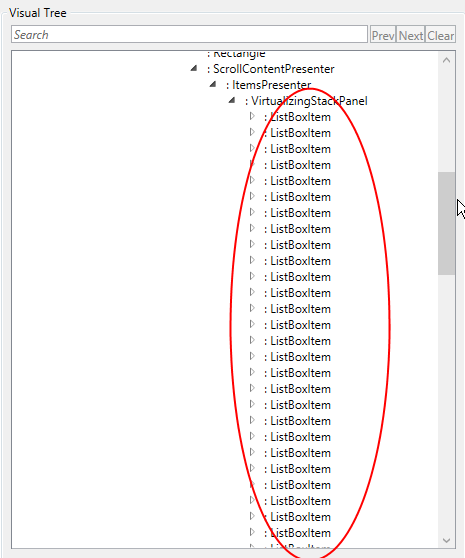 In the second ListBox, where we turned off UI virtualization, the visual tree contains a ListBoxItem for each of the 100 items in the source data.